In Lesson 7 we had a bird’s-eye view of (1) the world’s great empires that would rule for a period of about twenty-six hundred years and (2) the establishment of God’s kingdom, all seen from a monarch’s point of view. We also caught a glimpse of the power of faith in one young man’s life. Now let’s go to Daniel 7, the “B” in the “ABC’s of Bible prophecy.” During the interval between chapters 2 and 7, King Nebuchadnezzar died and his grandson (King Belshazzar) took the throne. This time it was Daniel the prophet who had a dream. It covers the same period and the same facts as Chapter 2; but different symbols are used because the dream was presented to a prophet instead of a monarch. Also, important details–such as the beast-like characteristics of successive kingdoms–are added! 1. What impressive dream was given to Daniel in the first year of King Belshazzar’s reign? “I saw in my vision by night, and behold, the four winds of heaven were stirring up the Great Sea. 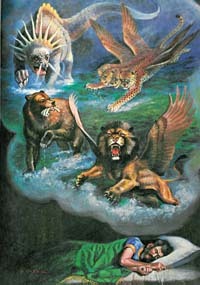 And four great beasts came up from the sea, each different from the other” (Daniel 7:2-3). Winds symbolize war, and the sea symbolizes multitudes of people. See Jeremiah 49:35-37; Isaiah 57:20; Revelation 17:15. 2. What is symbolized by the four beasts that come up one after another out of the sea? “Those great beasts … are four kings which arise out of the earth.” “The fourth beast shall be a fourth kingdom on earth” (Daniel 7:17, 23). Four nations–the same as in the image of Daniel 2–arise out of battle in populated areas. To Daniel, a spiritual man, God presented these nations as predatory, bloodthirsty beasts, gaining their power by force of arms. 3. How does the first beast compare with the head of gold in the image of Lesson 7? Wings denote speed, aptly representing the rapid conquests made by the Babylonian armies. (Habakkuk 1:6-8. Babylonia was in Chaldea.) The lion’s wings being plucked off matches both King Nebuchadnezzar’s humiliation, described in Daniel 4, and the empire’s decline. The change from beast to man symbolizes the king’s return to sanity and his conversion, described in the same chapter. The Babylonian Empire lasted sixty-eight years, from B.C. 606 to B.C. 538. 4. How does the lopsided bear resemble the image’s chest and arms of silver? “And suddenly [there was] another beast, a second, like a bear. It was raised up on one side, and had three ribs in its mouth between its teeth. And they said thus to it: ‘Arise, devour much flesh!’” (Daniel 7:5). As silver is the second most valuable of the metals, so the bear–although larger–is slower than the lion. The bear raising itself on one side represents the Persians, who later became more powerful than the Medes. The three ribs in the bear’s mouth portray three nations–Lydia, Egypt, and Babylonia–that Medo-Persia had to conquer to become a world empire. Persian dominance lasted 207 years, from B.C. 538 to B.C. 331. 5. What do the four-headed-and-winged leopard and the bronze thighs of the image have in common? “After this I looked, and there was another, like a leopard, which had on its back four wings of a bird. The beast also had four heads, and dominion was given to it” (Daniel 7:6). Bronze is third in value among metals, just as a leopard is weaker and smaller than a lion and a bear. The four wings symbolize an even more rapid conquest than that of the Babylonian Empire. Alexander the Great conquered all the territory from Greece to India in only thirteen years! He died at age thirty-two, and his empire was divided among his four generals. Grecian supremacy lasted 163 years, from B.C. 331 to B.C. 168. 6. How does the strong and terrible fourth beast parallel the iron legs of the image? “After this I saw in the night visions, and behold, a fourth beast [appeared], dreadful and terrible, exceedingly strong. It had huge iron teeth; it was devouring, breaking in pieces, and trampling the residue with its feet. It was different from all the beasts that were before it, and it had ten horns” (Daniel 7:7). Iron is the least valuable, yet the strongest, of common metals. No actual animal could illustrate the dreadful power of the Romans. With brute strength, Rome took over Greek territory in the east and south, advancing west as far as Britain. Under pagan Rome, about fifteen million Christians died as martyrs. Rome’s supremacy lasted 644 years, from B.C. 168 to A.D. 476! 7. Which beast particularly caught Daniel’s attention? 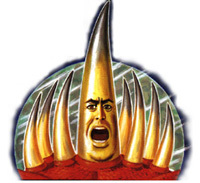 “Then I wished to know the truth about the fourth beast, which was different from all the others, exceedingly dreadful, with its teeth of iron and its nails of bronze, which devoured, broke in pieces, and trampled the residue with its feet; and about the ten horns that were on its head, and about the other horn which came up, before which three fell, namely, that horn which had eyes and a mouth which spoke pompous words, whose appearance was greater than his fellows” (Daniel 7:19-20). This beast seemed so significant that Daniel asked the angel for additional information. 8. What are the ten horns? “The ten horns are ten kings who shall arise from this kingdom” (Daniel 7:24). These are the same ten kingdoms that were presented as ten toes in Daniel 2, but here’s where it gets serious! 9. How does history identify the little horn that came up among the nations of Europe? “He shall be different from the first ones, and shall subdue three kings. He shall speak pompous words against the Most High, shall persecute the saints of the Most High, and shall intend to change times and law” (Daniel 7:24-25). History shows us that in A.D. 538, after subduing three Arian nations, the bishop of Rome became the most powerful ruler in Europe. Different from all other rulers, he claimed to be a priest-king, ruling both church and state, and to be authorized by God to forgive sins and consign people to eternal hell fire. The popes were bold! Among other things, they humbled and banned kings who resisted them. The popes had heretics burned at the stake, ignored the second of God’s Ten Commandments, which forbids the worship of images (Exodus 20:4-6), and demanded that Christians keep Sunday holy, calling it “the venerable day of the sun.” Lucius Ferraris, official Roman Catholic theologian, declared, “The pope is … not a mere man, but as it were God, and the vicar of God.” (Prompta Bibliotheca, art. “Papa,” II, vol. VI, pp. 26-29.) To this day, popes hold such blasphemous titles as “Lord God on Earth”! 10. 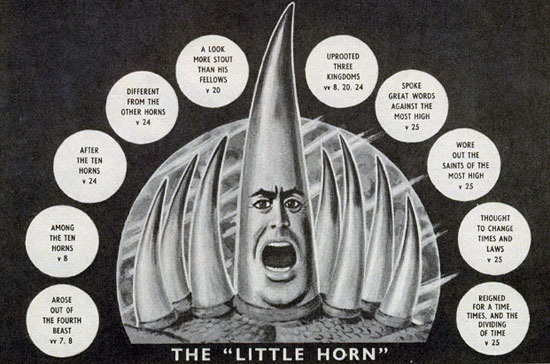 What other prominent characteristic does the little horn have? 11. What would the little horn also do? “He … shall persecute the saints of the Most High” (Daniel 7:25). According to conservative estimates, more than sixty million true Christians were tortured, burned, and otherwise martyred by the Roman Church during the Dark Ages. 12. How long was this religious oppression to last? “The saints shall be given into his hand for a time and times and half a time” (Daniel 7:25). A time is one prophetic year. (See Daniel 4:16, 23, 25; 11:13, KJV footnote). One time plus two times plus one-half time would come to three and one-half times, or three and one-half prophetic years. A day in prophecy, however, equals one year in literal time. Numbers 14:34; Ezekiel 4:6. So, in other words, each day in those three and one-half times (years) equals one literal year in fulfillment. Thus the political-religious rule of the papacy was to last for more than a millennium. Let’s see if this fits the facts of history. The political rule of the popes began in A.D. 538. Add 1,260 years, and we come to 1798. In that year Napoleon’s general Berthier deposed Pope Pius VI, who died in prison a year later. This dealt a severe blow to the papacy. For decades, succeeding popes were virtually powerless. 13. What destiny awaits the little horn? “But the Court shall be seated, and they shall take away his dominion” (Daniel 7:26). “I watched then because of the sound of the pompous words which the horn was speaking; I watched till the beast was slain, and its body destroyed and given to the burning flame” (Daniel 7:11). God will judge all the wicked at the appropriate time. 14. How are the closing details of this vision similar to those of the king’s dream in Daniel 2? “Then the kingdom and dominion, and the greatness of the kingdoms under the whole heaven shall be given to the people, the saints of the Most High. His kingdom is an everlasting kingdom, and all dominions shall serve and obey Him” (Daniel 7:27). Thus God told Daniel that His people will someday reign with Christ in His kingdom. What about … THE INTERPRETATION OF PROPHECY? • When should a Bible passage be taken literally? And when figuratively? A rule of thumb is that we should take everything in the Bible literally and in its most obvious meaning, unless it cannot be taken as such. Here are several examples: When the Old Testament calls death “a sleep,” we know that this is not the normal, natural sleep because we can’t wake up dead people. When Jesus said, about the passover and communion bread, “This is My body which is broken for you” (1 Corinthians 11:24), we take that to be figurative as well. We know Daniel’s dreams are symbolic because the angel supplied the meanings of some of the symbols. Also, it is important to understand that, when a prophecy has been conclusively fulfilled in the past, there is no need to look for further fulfillment in the future. Conversely, when the Bible says, “You shall not commit adultery” (Exodus 20:14), we understand exactly what that means and had better take it for what it says! And when Jesus said, “Love your enemies” (Matthew 5:44), He meant it just as He said it. In studying God’s Word, we need the Holy Spirit’s aid at all times, and our minds need to be subject to His guidance. This is especially true with Bible prophecy, for which people and churches have come up with an amazing array of interpretations. Unless we use common sense as a criterion, interpretation can know no bounds–even when a concept is crystal clear. However, if we humbly seek the God of the Bible, His Spirit will lead us into divine paths and interpretations, for “no prophecy of the scripture is of any private interpretation” (2 Peter 1:20 KJV). It is clear that if there were no obvious way to interpret the Bible, God could not hold us responsible for its instructions. Yet He will hold us responsible. He said so. John 12:48; Revelation 22:18-19. Daniel wasn’t interested in knowing more about it. it developed a priest-king who boasted against God. a small horn came up in the place of three horns. attempted to change God’s times and laws. symbolizes the emperor of Rome. claims to be Christ’s vicar. was kind and generous to all the people. ruled both church and state. says he is authorized to forgive sins. claims to be able to send people to hell. one prophetic year (360 literal years). an indefinite period of time. an indefinite length of time. three and one-half literal years, or 1,260 days, from A.D. 1793 to A.D. 1797. 1,260 years, from A.D. 538 to A.D. 1798.
great for the papacy since it will reign with Christ in His kingdom. not good for the beast. It will be slain.